São Jorge (also known in English as San Jorge) is an island in the central part of the Azores. It is separated from Pico Island by 15 km with a strait. Its east to west length is 53 km and its north to south width is 8 km. The area is 237.59 km² and the population is 10,500. 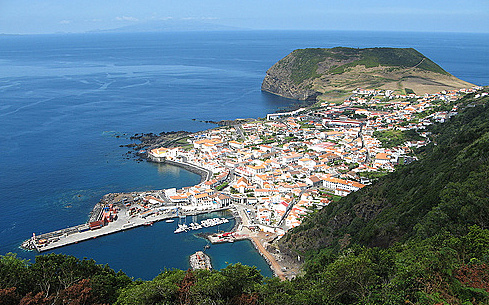 São Jorge is a volcanic island, as are many of the Azorean islands. It has erupted six times between 1580 and 1907. Ten people were killed by the 1580 eruption and eight in 1808. In both eruptions small glowing clouds were reported. A possible submarine eruption was reported southwest of the island in 1964 but was not confirmed. São Jorge has been described as an island that is like a ship anchored to the ocean, perhaps a commentary on the myriad attractions the island offers. At least this much is certain, its natural beauty is undeniable: mountain ranges, volcanic cones, checker board tilled fields, fajas along the coast, verdant bird-inhabited islets, natural bridges and arches along the coast, grottoes and various rocky formations, striking waterfalls and streaming rivers, green pastures with blooming wild flowers, and vineyards and orchards growing atop fertile flatlands. 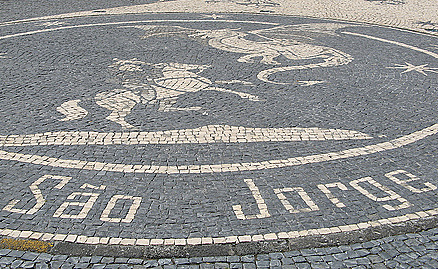 São Jorge was first discovered in 1439 but wasn’t populated until 20 years later when colonists from Europe arrived. The island achieved prosperity rather quickly, producing grapes, wheat, archil, and woad, which were exported to Europe. After Philip II of Spain took the Portuguese throne, São Jorge soon afterwards capitulated to the Spaniards in 1583. In the 16th and 17th centuries, the island was subjected to corsair attacks and raids by the English, French, Algerians, and the Turkish. In addition to the frequent raids and invasions, São Jorge suffered through bad crop years, food shortages, and hunger throughout the 16th to 19th centuries as well as earthquakes and volcanic eruptions in 1580, 1757, and 1808. In the last century, the island has progressed and prospered thanks in part to the development of its two main ports, Velas and Calheta, and the building of a modern airport. These developments have brought an end to the isolation of the island, which has now established a relatively productive dairy, fishing, canning, and livestock industry. Many visitors of São Jorge today find the island to be a tranquil destination where nature can be appreciated intimately. The island is particularly acclaimed for its beautiful Fajãs (coves), which are pieces of land ripped from the high cliffs, the Fajã de Caldeira de Santo Cristo being an example of one. This site has a small lagoon next to the ocean that has the only fresh water clams in all of the Azores. 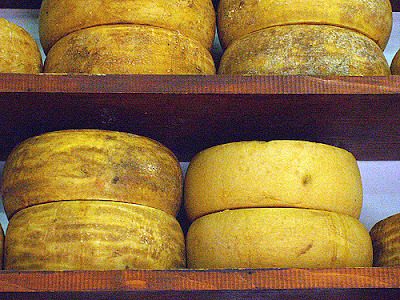 It also shelters an underground cave and lake and is located in the Ribeira Seca area. Mountain ranges and volcanic peaks are also a big part of São Jorge. The Pico de Esperança is the highest point on the island at close to 3,500 feet high, with breathtaking views of the remaining island as well as the Azores islands of Terceira, Faial, Pico, and Graciosa. The Igreja de Urzelina is an interesting volcanic site as well, created by the 1808 eruption of Pico da Esperança. The site features the church tower of Urzelina, all that remains from the burying of the old town induced by the eruption. There are a number of caves and grottoes on the island as well. Algar do Montoso is the site of rock formations, as is Furnas da Pombas. The latter’s volcanic formations are inhabited by wild pigeons. Both sites require guides and equipment to explore. São Jorge is also greeted by a number of islets like Topo and Rosais, both are nesting habitats for a number of migratory and seabirds. Both sites are rocky and full of endemic Azorean flora, worth visiting if you are a nature enthusiast.